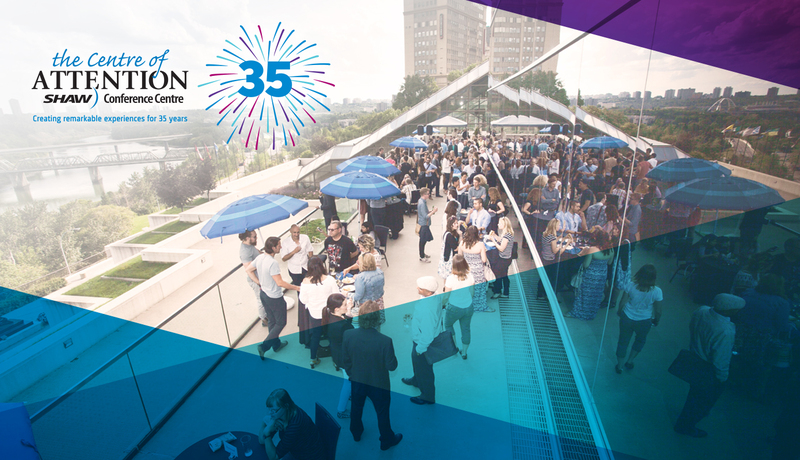 The Edmonton Convention Centre (SCC) will celebrate 35 years of REMARKABLE experiences on June 22, 2018. To commemorate this milestone, Edmontonians are invited to attend a free, public celebration on the Edmonton Convention Centre’s Hall D and River Valley patios on Friday, June 22 from 4:00 p.m. – 8:00 p.m.
With awe-inspiring views, a mouth-watering farm to table food experience served up by the Edmonton Convention Centre’s 11 Red Seal chefs, cold drinks, an urban beekeeping demonstration, and live music, this is the can’t miss party of the summer! All food and drink items are only $5, and the menu features everything from Chef’s Montreal smoked meat sandwich to our famous chicken and waffles, bannock vegetarian tacos, and local garden inspired sweet treats. From Prince Charles and the late Princess Diana to US Presidents, world-class musicians, business leaders, popes and more, the Edmonton Convention Centre has welcomed the world to Edmonton. Leading up to the event, 35 historical facts will be released on the convention centre’s social media channels and blog. For more information on the 35th anniversary celebration, visit our website or Facebook event.